The Vermont State Employees Association was seeking a transformational leader who could take the 5200-member union in a new direction when it hired Mark Mitchell last December. Ten months later, the new boss is getting mixed reviews. Several former employees of the union say Mitchell’s hard-charging style prompted a staff exodus and poisoned relations with legislators and administration officials. In the last five weeks, six of the union’s 19 staff members have departed — four of whom told Seven Days they feared the new executive director was causing irreparable damage to the organization. A 14-year veteran of the union, Kirk served as its senior field representative until she left for a job in the state’s Department of Human Resources late last month. In her letter, Kirk criticized Mitchell for antagonizing legislators and administration officials with whom the union must negotiate to preserve the jobs and increase the wages of its members. As the sole union representing state employees, the 68-year-old organization’s membership includes two-thirds of the state’s 7800-person workforce. Kirk’s letter also blamed Mitchell for failing to learn about the union’s day-to-day operations and its collective bargaining agreements. It claimed he’s failed to earn the trust and confidence of his employees. In addition to Kirk, other recently departed employees include the union’s operations director, fiscal coordinator, legislative coordinator, legislative assistant and an administrative assistant. All but one exited voluntarily. The prior fiscal coordinator left earlier this year. No current or former VSEA staff members contacted for this story were willing to speak on the record, but four discussed the situation on the condition of anonymity. “She’s pretty justified in saying most of what she’s saying,” said another ex-employee. Calling it a personnel matter, the VSEA declined to make Mitchell available for an interview, but the president of its board of trustees, John Reese, spoke extensively in defense of his executive director. Reese characterized the recent turnover as an expected outcome of Mitchell’s work to implement long-sought changes to the union’s mission. At the direction of the board, the VSEA is attempting to move from a “service model,” which relies upon central staff to file all grievances and negotiate contracts, to an “organizing model,” which seeks to empower rank-and-file members to help conduct union business. To support the shift, the VSEA plans to create five new positions, three of which would be on-the-ground organizers. At its annual meeting last month, Reese said, its membership voted 2-1 to raise dues by $94.38 a year — to an annual $441.48 — to pay for the new positions. Reese attributed early tensions between Mitchell and state officials to his previous work in regions where labor tactics tend to be more rough and tumble than in Vermont. In the 20 years since he earned a law degree from the University of Southern California, Mitchell held eight labor jobs in California, Florida and South America. He’s represented nurses, teachers, engineers, opera singers, TV writers and garment workers. “It’s a different environment and I think that Mark’s approach to dealing with folks — especially early on — was surprising to them because they hadn’t seen a real labor guy come in from the outside who’s had to have knock-down, drag-out fights with administrations and politicians,” Reese said. 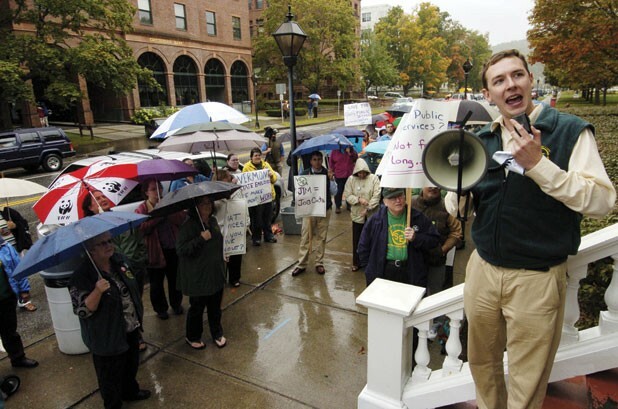 Vermont AFL-CIO president Ben Johnson sees that new approach as a positive — both for the VSEA and Vermont’s labor movement generally. State officials have been less charmed by Mitchell, noting his approach is an unwelcome departure from that of former executive directors Jes Kraus, who now directs UVM’s office of affirmative action and equal opportunity, and Annie Noonan, now Vermont’s Commissioner of Labor. Exacerbating the VSEA’s political problem is the departure of the union’s two-member lobbying team, which includes widely respected former legislative coordinator Conor Casey. He left the organization Friday to take a new job with the National Education Association in Connecticut. Mitchell’s aggressive approach was on display last month, state officials said, when the Vermont Veterans’ Home in Bennington faced scrutiny from federal regulators. The state-run, 140-resident facility nearly lost federal certification — and the $10 million of funding that comes with it — following allegations of abuse and neglect. While federal regulators ultimately spared the facility, state officials were peeved that Mitchell blamed the home’s problems on understaffing. Much to their dismay, Mitchell took to the airwaves of WCAX-TV to continue castigating the administration on the very day Gov. Peter Shumlin announced that the facility had been spared decertification. In her letter, Kirk argued, “Mr. Mitchell has initiated a culture of conflict there and asked the community to draw attention to deficient patient care, which has now undeniably caused the State and Federal authorities to find multiple VVH deficiencies,” she wrote. Reese said that in the wake of the Vermont Veterans’ Home controversy, he received 50-60 emails from members who work at the facility praising the union’s actions and just two or three emails complaining about it. Ultimately, whether Mitchell stays on at the VSEA will be the decision of its board of trustees, who have not met since they received Kirk’s letter. Several trustees declined to comment on the record, but their perspectives on the matter ranged from full-fledged support for Mitchell to confusion about the staff departures and concern about whether the board has sufficient information. “The board has received the letter and we’ve been in touch about the situation,” Reese acknowledged.